H: So, what do you do when you're a fly fishing guide and hurricane Irene sweeps in and wrecks havoc on your hood, leaving you without power for 3 days, and obviously no guiding trips on the raging rivers nearby? Well, if you're Antoine Bissieux, you organize and count your flies: 11,623! 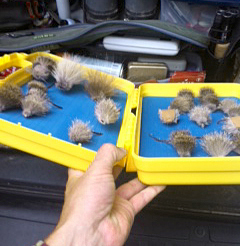 You can also create a small mice (and bunny) regiment for future nocturnal fishing maneuvers. Antoine's mice battalion--ready for action. Well, I was inspired to find out how many flies I have. It took all of 2 minutes to count them. Turns out I have 195 flies: 105 dry flies, 58 nymphs, 20 streamers, 4 poppers (which I have yet to use), 8 wet flies. 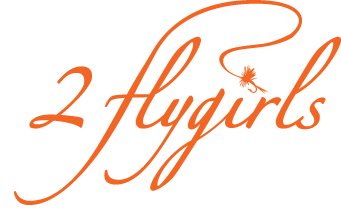 The 2 flygirls were on the Farmington river this past weekend. Irene has clearly left her mark--the river is dramatically changed. Full report to come from my French-Canadian half. Listen to this... I accidentally washed one of Antoine's mice. When it was time to collect my wash out of the machine, there it was! I must of jump 10 feet, I thought I had wash a real mouse! ** Antoine, you built really solid mice. It was intact and ready to go fishing!! !